Parents and teachers served refreshments. AS a result of efforts by the Punjabi Language Education Association (PLEA), Punjabi classes have been held at Queensborough Middle School (QMS) in New Westminster for many years now. 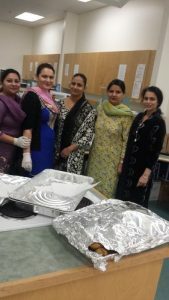 And under their Punjabi teacher, Deep Singh Sangra, the students of the Punjabi classes at QMS have been celebrating Vaisakhi for the past several years. This year again they celebrated Vaisakhi last week on April 11 with students greeting guests with a “Happy Vaisakhi” at the main entrance to the school. The Punjabi class students explained the significance of Vaisakhi and the birth of the Khalsa. They also put on cultural performances before students, teachers and invited guests, including Dr. Gurnam Singh Sanghera, Rajinder Singh Pandher, Harbhajan Singh Athwal (President of Khalsa Diwan Society, New West) and a large number of parents. Parents and the local Sikh community provided samosas and and Indian sweets for the occasion. They also raised $480 to help needy students at the school. Eshnoor and Yasmine were emcees and Jaiden and Mehr took care of the music. Gurnoor performed on the table. Harj, Jovan, Sartaj, Indervir and Harman gave a Vaisakhi presentation. Mansimran gave a talk on Vaisakhi. Gunjot, Khushpreet, Harveen, Kajal, Avneet and Jasleen entertained the audience with their Bhangra performance. They were followed by a Bhangra performance by Harveen, Jasleen, and Zeenat. Neha and Priya recited poems about Vaisakhi. A Gidda performance by Gurveen, Aeshpari, Zeenat, Jasleen, Harveen and Avneet reminded one about Punjab and its very rich folk songs and culture.